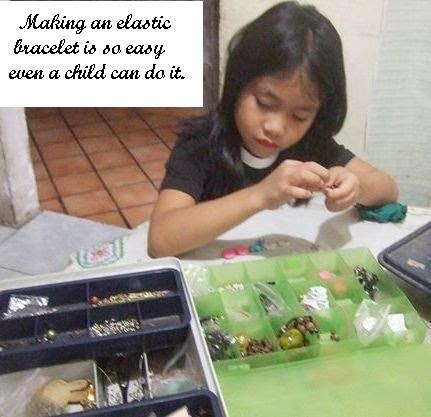 Making an elastic bracelet is so easy you can consider bonding with your child doing it. You only need an elastic cord, a stopper (a bead or a paper binding clip will do), hypo cement (this is optional) and beads of your choice. You may consider designing your pattern for a start. 1. Adjust the length of your cord depending on the size of the project. 2. Add a bead stopper to one end.You can use a bead for a stopper. 3. Then string the beads one by one until the last bead. 4. Tie a square knot. Pull the cord to tighten the knot. 5. Trim off the excess cord leaving about 1/4 inch on each end, and then dab some glue on the knot. 6. Finish by inserting the excess cord to one of the beads or two. 7. Allow the glue to dry before using the bracelet.